2018 should be the last year for the 3 in its current form. Updates for 2018 include a Smart City Brake support option on the GX trim and an I-Activesense package is now available on the GS model. The 2L four under the hood of mainstream 3s is flexible, quiet and smooth. The automatic transmission works very well. The bigger 2.5L is smooth and punchy but doesn't feel that much quicker than the 2L in typical driving. Mazda spent a lot of time developing the 3's suspension, as the car absorbs bumps adroitly and grips tenaciously in corners. The 3's steering is perfectly weighted and quite precise. Strong brakes. Good control of wind noise and tire noise but road-borne grit pings loudly off the floorpan. Large door mirrors are a necessity as the stout centre pillars, heavy rear roof supports and small side windows restrict visibility, especially on the hatchback. GX and GS drivers face a gauge package featuring a central speedometer flanked by digital readouts, a tachometer on the left and a gas gauge on the right. GT buyers gaze upon a central tachometer, part of which contains a digital speedometer. Overall the dashboard looks like a modern interpretation of BMW's long-standing dash design. Like some recent BMW and Mercedes-Benz models, the 3's dash is the anchor for a large, aftermarket-looking screen. The screen displays audio, and if so equipped, navigation information. Like on the 6, the 3 utilizes a BMW iDrive-like rotary knob that controls the various functions displayed on the screen. Comfortable front seats combine with a tilt and telescoping steering wheel for an excellent driving position. Space is snug up front, and with a low-mounted seat and limited legroom, rear seat room is limited for anyone over about five foot eight, and the sloping rear roofline and small lower door aperture limit access. With convincing faux-alloy and piano-black accents, as well as matte finished plastic, chic upholstery and copious soft-touch surfaces, the 3's cabin looks very upscale. Very good audio system performance. Two inline fours, a 2L unit and a 2.5L, are available. Two six-speed transmission, a manual and an automatic, are offered on all trim levels. Offered without air conditioning, even as an option, the $15,900 GX base model is just a means to permit Mazda to advertise a low-low MSRP. The GX with the Convenience and Comfort packages ($20,100) adds air conditioning, cruise control and Bluetooth, is essentially the base model for most buyers and is competitive with cars like the Corolla LE CVT and Civic LX CVT. Upgrading to the GS trim level, with features like heated seats and steering wheel and safety gear like Smart City Brake Support and blind spot with rear cross traffic warnings, is a bit of a bargain. The GT model is equipped with an automatic transmission and sunroof as well as the larger 2.5L four, which accounts for about $1500 of the price bump to move from the GS to the GT. The GT Premium package is spectacular value if you like its additional equipment. The hatchback body style is priced $1000 higher than a sedan with the same equipment. Unimpressive lease terms for 2018. Average reliability predicted. Rust, a significant problem with the first 3, did not show up on the second generation car, and Mazda now offers a seven year warranty on the body. Minor exterior styling retouches, with a new centre console and updated infotainment screen inside. The iOS-Android cell phone interface is standard for 2018. The RVR's 2L four lacks torque below 3000 rpm, is noisy and performs just adequately when hooked to a manual transmission with excessively high gearing. Precise, long-throw gearchange allies to a progressive clutch. The available CVT works well enough but employs a lot of noisy revs from the coarse engine to deliver tepid, unenthusiastic acceleration. Good control of road and wind noise combines with low-rev cruising to make the RVR a relaxing car on the highway. An absorbent ride is accompanied by noticeable lean in corners, which turns to understeer when pushed. Porpoising is evident on long undulations and the car can be deflected off its path by mid-corner bumps. The brakes have an inert pedal feel. Light, lifeless steering. The RVR's cabin is fronted by a classically conservative dashboard housing clear instrumentation and straightforward controls. The dash and the upper door panels are padded in a material with a very upmarket appearance, and while most other surfaces are hard to the touch, their matte finishes are quite attractive. Faux alloy trim pieces brighten the cabin. The front seats are large, deeply padded, very comfortable and are swathed in appealing fabrics. The door panels have cloth inserts matching those on the seats. With good space utilization, the RVR can easily house a quartet of adults and can take three people in the back seat for short hops. The APA's top spec GT model was equipped with a name-brand audio system that produced very pleasing sounds. It also featured a fixed, full-length glass roof panel equipped with an electrically-retracting screen that fully blocked the rays of the sun when closed. The roof was frustrating in that most drivers would prefer at least some part of it to open. That said, rear seat passengers enjoyed the panoramic views afforded by the massive glazed area. Small lights, located alongside the tracks of the sunscreen reflect onto the glass, which amused some passengers, especially at night. The RVR's regularly-shaped cargo bay is a bit shallow below its cargo cover, but expands considerably when you fold down the rear seats. Mitsubishi offers the 2L four as well as the 2.4L, but should withdraw the 2L as it is slow and noisy. The car is marketed as an SUV or crossover, but in terms of size, versatility and price, it is in reality just a tall hatchback. All-wheel drive, not offered on the base ES trim, is a $2200 option on the base SE but standard on the SE Limited, SE Anniversary and GT trims. Moving up from the ES trim to the SE is a bit overpriced. The price gap between the SE and SE Limited reflects the value of the equipment gained by stepping up and also includes the stronger 2.4L engine. Good value GT model. The GT Premium package, which includes leather seating, power driver's seat, name brand audio system, a luggage cover, as well as forward collision, pedestrian and lane departure warnings, is a bargain. Good value leasing. Not rated. Insufficient data available on this recent model. The long warranty attracts some customers to a Mitsubishi. Some replacement parts are very expensive. The SL trim has been discontinued. Automatic emergency braking is standard on all models equipped with a CVT transmission. 2018 should be the last year for the current Sentra. Linked to CVT, the Sentra's 1.8L four feels strained while accelerating but does cruise quietly enough. Light, lifeless steering. The suspension absorbs moderate bumps well but loses its composure over major dips and is a steady, if unenthusiastic handler. The cabin is fronted by a dashboard housing large, crisply-marked gauges and a centre stack stocked with logical controls. Pleasing shapes and some nice faux alloy accents are cabin highlights. Substantial, comfortable seats front and rear. Impressive cabin space for a compact car. Big trunk. The Sentra would be an excellent urban taxi. Two transmissions, a six-speed manual and a CVT, are offered. Oddly styled and a wheezy, reluctant performer, the Sentra has failed to gain a big following in Canada, with sales trailing the class leaders like the Civic and Corolla by a significant margin. The Nismo model has a multitude of serious performance-oriented upgrades that should combine to deliver a pleasurable driving experience; a change from the mainstream Sentra's milquetoast on-road demeanor. 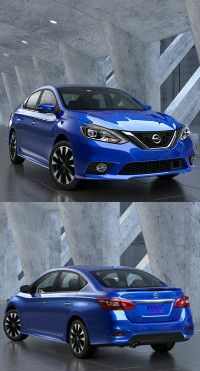 At $15,898, the Sentra S, lacking both air conditioning or an automatic transmission, which, if added, increases the price to $19,258. The SV trim upgrade, with equipment such as dual zone air conditioning, heated seats and Keyless Go, is a bargain and the best value of the lineup. The SV Style and Technology packages are very good value. When you account for its extra equipment compared with the SV, the turbocharged engine is the SR model is essentially free. The SR Premium package is priced to reflect the value of its content but the NISMO model is overpriced. Good value leasing for 2018. That said, monthly payments for financing are too similar to those of much better, more durable cars like the Honda Civic and Toyota Corolla to be considered seriously. Not rated, Insufficient data. Reliability is predicted to be average to below average. The 6000 oil change and service intervals are more frequent than the competition, as is replacing the serpentine accessory drive belt at 96,000 km. .
City Fuel Economy: 8.9L/100 km. Highway Fuel Economy: 6.8/100 km. Active Safety Features: Available with active cruise control, forward collision warning, forward emergency braking as well as blind spot and rear cross traffic warnings. No updates of note for 2018. New from the ground up, and based on an all-new platform which will find its way under future Subaru vehicles, the new Impreza went on sale in late 2016. The styling is no great leap forward, but is contemporary and nicely detailed. The cabin is conservative, tasteful and assembled from attractive components. Comfortable seats and good legroom ally to welcome a quartet or adults. The new Impreza's dashboard is stocked with clear gauges and straightforward controls. Adding direct-injection to Subaru’s 2L flat-four ups its horsepower from 148 to 152. Power reaches all four wheels via either a five-speed manual transmission or a CVT. Driven briefly by the APA, the new Impreza is quick enough and acceptably refined in normal driving but does get quite raucous when pushed. The steering is quick, precise and nicely weighted. The new Impreza's cosseting ride and crisp handling reflect a lot of careful development on the part of Subaru. The Impreza is now built in the United States. Available in sedan and hatchback body styles, with the hatchback commanding a $900 supplement over a sedan of the same trim level. The base Convenience model is very well equipped but upgrading to the Touring, Sport and Sport-Tech trims are all good value. The base Impreza sedan is priced less than $400 more than a Honda Civic LX but features all-wheel drive. Be careful when shopping to get what you actually want because the names of the Sport and Sport-Tech trim levels are bound to confuse some shoppers. A Sport with the Tech package is not a Sport Tech and a Sport-Tech does not necessarily have the Technology package. Tempting leasing terms. New vehicle, not rated. Subaru engines lack durability so an extended powertrain warranty is recommended if you plan to keep the car past the five year/100,000 km powertrain warranty. The second-generation Crosstrek, based on the new 2017 Impreza, went on sale in the summer of 2017. The Crosstrek migrates to the new platform that underpins its donor vehicle, the Impreza, for its second generation. Essentially an Impreza on stilts with some extra body cladding, Crosstrek styling follows the same formula as its predecessor. The cabin shares the Impreza’s very good space efficiency but is trimmed with more adventurous fabrics and finishes. Jacking up the Impreza allows Subaru to market a second nameplate off Impreza components and charge a large premium for the higher ground clearance version. A normally-aspirated 2L four producing 152 horsepower is the sole engine offered on the new-generation Crosstrek. Crosstrek buyers can pick from either a six-speed manual transmission or a CVT automatic. The base Convenience trim level is equipped well enough to suit the needs of many buyers. The Touring trim upgrade includes features such as automatic climate control, heated front seats and a cargo cover, is good value as are the Sport and Limited models. Good value leasing. That said, the Crosstrek is considerably more expensive than the Impreza it is based on, with only some extra body cladding and ride height to show for it. Regardless of value, the Crosstrek has sold well and buyers seem happy to pay the extra money for its "off-roader" look. Average reliability for the first five years. Previous Subaru flat-four engines have had head-gasket failure issues and early versions of the new-generation 2L engine in the Impreza and Crosstrek developed an excess oil consumption problem which led to engine failures as owners of new cars weren't expecting oil consumption. Subaru claims the issue has been fixed but owners of 2015 model year cars are now complaining about engine problems. An extended powertrain warranty is recommended if you plan to keep your Subaru past the five year/100,000 km powertrain warranty.